You are here... :Home/Facial Treatment, Organic, Skin Care, Skin Protection/Skin~Tegrity – Your Answer to Beautiful Skin! We at The Creekside Creations conducted an extensive “Product Market Study” during the development of our new Skin~tegrity© Facial Care Line. Eighteen women participated in our study. They each agreed to use the products exclusively for 4 – 6 weeks. They received a comprehensive packet with information, instructions, and objective questions as well as an area for subjective dialogue on each of the products. Please take the time to fill out the first part of this study at the beginning of your trial time. This will offer us a starting point regarding your facial concerns, needs and desires, as well as your opinion on what is a priority in a natural skin care line. After the 6-week study is done, the sections that follow will focus on each of the Skin~tegrity© products. Please fill this part out after you have used the products on a regular basis for at least 4 weeks. We ask you to take a photo of your face at the beginning of the trial and at the end of the trial (weekly, if possible). The photos should be taken at the same time of day with as close to the same lighting as possible. Below is a sample of the Before and After Photos. Please note that these photos have not been touched up, “photoshopped,” enhanced, or air-brushed in any way. 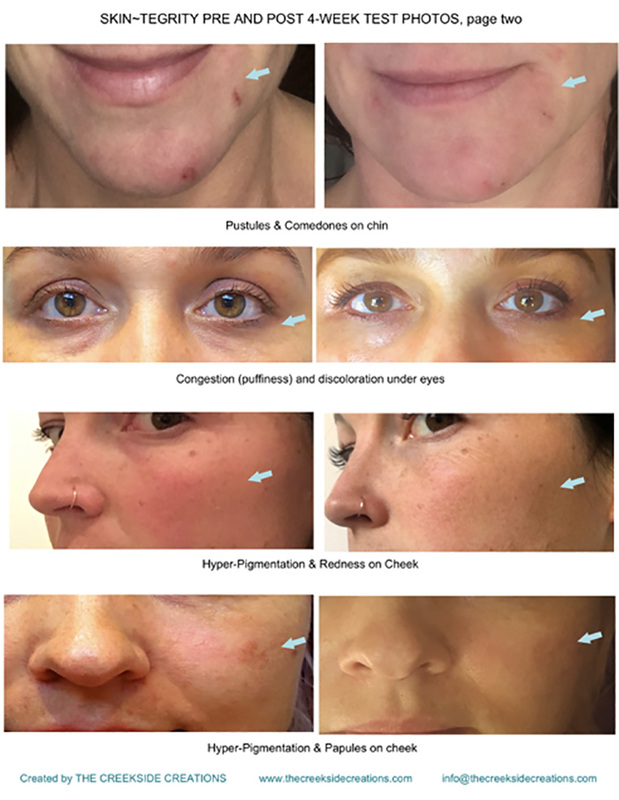 We analyzed the photos, cropped the areas that showed change (good or bad) during the course of the study, and present them here as a method to substantiate the effectiveness of the all-Natural, organic and vegan Skin~tegrity© Intensive facial line. Upon receipt of the finished study surveys, we identified the primary skin concerns from the Testers. We present those concerns here, along with the ingredients found in the Skin~tegrity line that address them. ** Photos and Information are Taken from a Market Product Study, Summer 2017. All reproduction rights are held by The Creekside Creations, under the copyright Skin~tegrity ©.